Heidi Klum for New Balance, a new collection of versatile active-wear pieces designed by the ultimate stylish multitasker. Made from luxe fabrics that are as soft on the skin as they are effortlessly chic, HKNB Heidi Klum for New Balance offers go-anywhere clothes for women who want to look stylish and feel comfortable. 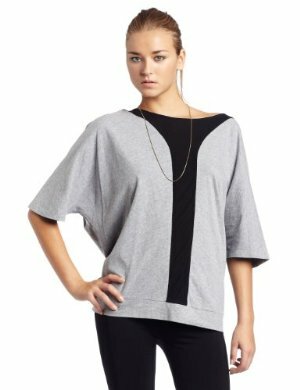 This graphic top is a "Project Runway" winning design. It's lightweight and flowy and catches the eye with a T-shaped charmeuse insert. A "Project Runway" winning design, this flattering long sleeve dress features asymmetrical charmeuse inserts and has a banded bottom. This sophisticated take on a zip-down sweatshirt is a "Project Runway" winning design. It features several diagonal charmeuse inserts and has a drawstring at the hood. We would love to have advertising or even a simple one sentence phrase with a few words linked to their site if possible. Look forward to hearing back from you and listening to any other ideas you may have. Hot mamas! I love it.